How old is too old for dental implants? People are living longer and healthier lives and it is not uncommon for people to reach an even older ages.Many however,lose their teeth over time due to decay or gum disease and end up with partial or full dentures. 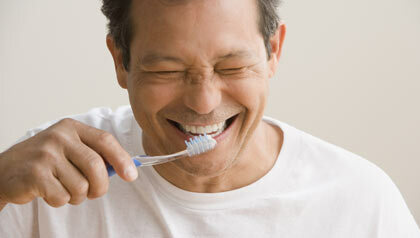 The dentures become loose, gum tissue becomes sore, and eating becomes very difficult. The elderly love to stay social, eat good, and share great times with family and friends without the embarrassment and difficulties that come with denture use. The quality of life is especially important at this stage. Therefore no age is too old for dental implants. Dental implants dramatically improve life quality for many older individuals by letting them eat better, get better nutrition, stay more social, and lead active and vital lifestyles. Dentists should recommend dental implants instead of conventional dentures to every patient. Dental implants are now the standard of care for replacement of missing teeth. Conventional dentures cause irreversible damage to the jaw bone and significantly compromise patient’s chewing functions and therefore should be avoided. Dental implants allow patients to eat any food they want comfortably and get the necessary nutrition. Implants effectively support the overlying teeth and prevent them from movement and accidental dislodging. Additionally, dental implants preserve the jaw bone and prevent bone loss that occurs from conventional dentures.